Lowe’s Market décor, including departmental signage, is designed specifically to target neighborhood shoppers, according to Lowe, who says the company – which was founded in 1964 by Roger C. Lowe, Sr. – has grown primarily through acquisitions. When a new store is acquired, its décor is updated; and, regular store remodels are completed every seven to 10 years, says Lowe. For the past three years, these updates and remodels have been designed, fabricated and installed by The Store Décor Co., of Rowlett, Texas. The Store Decor Co. specializes in “creating retail environments for some of the nation’s leading retailers that welcome customers through innovative and visually exciting interior signage, graphics and decor,” according to Patti Ellis, sales director, The Store Décor Co., who says the company has completed design work for approximately 20 Lowe’s Market locations. When The Store Décor Co. was asked to update the look of an acquired Lowe’s Family Center (a combined full-line supermarket and Lowe’s ACE Hardware Store totaling 52,000 square feet) in West Odessa, Texas, its graphic designers turned to Roger Lowe for his take on the neighborhood’s demographics – including a large Hispanic population of middle-income to lower-income families employed in blue-collar jobs. At the same time, The Store Décor Co.’s production-department employees turned to their imaginations to develop a new time-and-materials-saving fabrication method for creating cutout letters with a trim-cap look out of Gatorfoam® and Gatorplast® graphic display boards by 3A Composites USA. That design included everything from departmental wall and hanging signs as well as aisle markers – all created from Gatorfoam and featuring a colorful Western theme of bucking broncos and oil rigs, as well as the Lone Star State’s flag prominently incorporated. 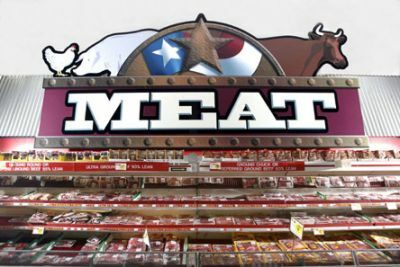 For example, an 8-foot by 20-foot lettered meat department wall-mounted sign features a cow, pig and chicken surrounding a semi-circle image of the Texas state flag. (These images were direct-printed on multiple layers of 3/16-inch, ½-inch and 1-inch thick Gatorfoam with a Vutek Pressvu UV 180/600 digital printer and then cut out with a CNC router.) Similarly fabricated, the large lettered produce department wall-mounted sign features the same Texas state flag image surrounded by overflowing baskets of fruits and vegetables. 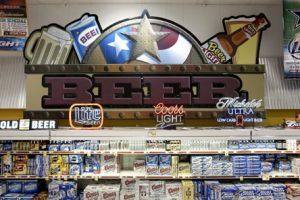 And, a large lettered beer wall-mounted sign positioned above a refrigerated storage case features the flag image flanked by a filled beer mug and open can on one side and a filled beer glass and bottle on the other. 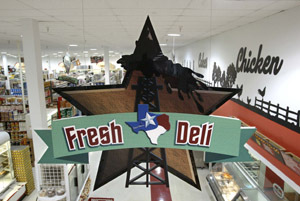 Hanging departmental signs, such as the one created to designate the deli meat aisle, repeat the Lone Star theme. A single brown star, decorated with an oil rig gushing rich Texas oil, features a Texas map image printed with the state flag’s colors. A green ribbon lettered with “Fresh Deli” designates the aisle. The hanging signs also were direct-printed on 1-inch thick Gatorfoam and cut out with a CNC router. Gatorfoam, the original heavy-duty graphic display board, consists of polystyrene foam and sturdy wood-fiber veneer facers. This unique construction makes Gatorfoam lightweight yet durable, rigid and warp-resistant; its surface also is exceptionally smooth and strong. Gatorfoam may be digitally direct-printed, direct screen-printed and painted with most ink and paint systems. The white Gatorfoam graphic display board line recently has been enhanced with dramatically brighter facers that produce eye-popping graphics in both direct screen-printing and direct digital-printing operations. Gatorfoam also may be used in both dry mounting and pressure-sensitive mounting applications. Gatorfoam cuts cleanly with standard woodworking tools and will not tear, chip or shred. 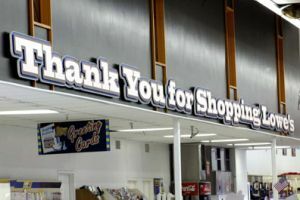 The Store Décor Co. turned to Gatorfoam and Gatorplast to create large cutout trim-cap-look letters with the message “Thank You for Shopping Lowe’s” for wall-mounting above the store’s cash register checkout area. The “Thank You for Shopping Lowe’s” letters were specified to be 2-feet tall and cover 64 feet on the wall. In order to simplify this process, two Store Décor production department employees – Bradley Hall and James Copeland – developed a new fabrication process to create cutout letters with a trim-cap look without applying the trim cap. The BJ Cap Letter process – named after its creators – involved scooping the foam center out of 1-inch thick Gatorfoam (painted blue), routing shapes and indentions with a CNC router, and applying a ¼-inch acrylic media in red. The letters’ top layer was created from 3/16-inch white Gatorplast direct-printed with a Vutek digital image to achieve a dimensional look. Since its installation in June 2003, the updated décor at the Lowe’s Family Center in West Odessa has been appreciated by customers and store management alike. “The Store Décor Co. offers us great artistic talent,” says Lowe. “They take the time to really look at the community. As a family business, we want to be part of that community. We’ve been very pleased with this update. This is one of the nicest stores that they’ve done for our company. For more information about The Store Décor Co., call Patti Ellis at 1-800-831-3267, extension 2230, or visit www.thestoredecor.com.